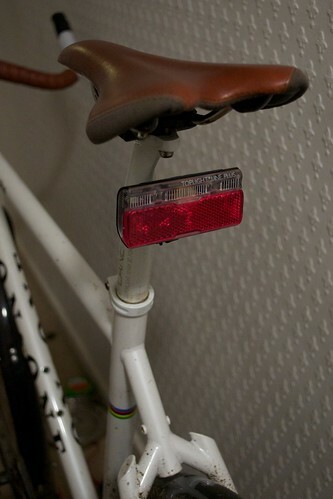 The best rear light in the world to date? I’ve written in depth on headlights like the Lumotec Lyt and Lumotec IQ Cyo. While many people are happy to pair these dynamo headlights with a bog-standard battery blinkie, why not go one step further and use free dynamo energy to blast nonstop red light in your wake? 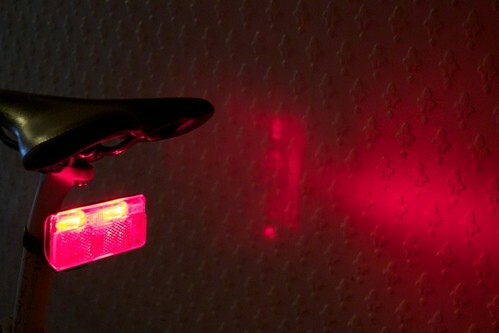 Combining a rear reflector and light in a featherlight package which weighs the same as two naked AA batteries, Busch & Müller’s Toplight Line Plus is officially road legal in the EU (without supplemental reflectors) and the technology behind its design puts basic blinkies like the Superflash, Cherry Bomb or RSP Astrum to shame. First, a word of warning. You obviously need a dynamo to use a dynamo rear light. Don’t hesitate, you won’t regret the high initial outlay I promise! Technically there’s no reason why you couldn’t run the Toplight Line Plus from a dynamo without a dynamo headlight, it would just make you odd (but if i.e. you break your headlight, don’t worry, the tail light will keep going happily plugged right into the dynamo while you make do with a headtorch or similar). Before you write this off as all a bit Heath Robinson, I should point out that I’ve ridden with this for 36 months as a daily commuter and on thousands of kilometers of brevets including as my sole tail light on the 1200km Paris-Brest-Paris. Apart from having a sophisticated reflector (which is brighter from behind the wheel of an approaching car than many battery tail lights! 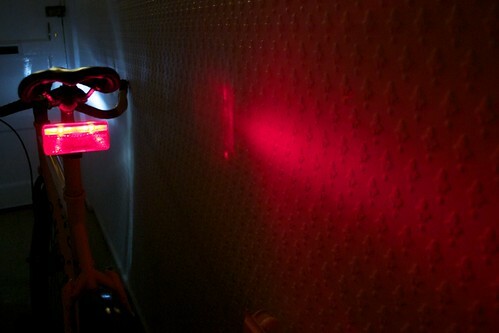 ), the Toplight Line Plus also uses a cunning fresnel to distribute red light over a wide angle. A strong band stretches from one side of the road to the other – but not down at the tarmac or up into the stratosphere. The killer feature of the Toplight Line Plus is its large cross-section, going on for 3x the area of my previous Superflash rear lights. It’s even better than that in practice, because where lights like the Cherry Bomb or RSP Astrum project most of their light as a point source (i.e. something that an approaching driver can’t so easily estimate for distance) the Toplight Line Plus is a uniform bright area of 42.5 sq cm. This makes estimating the distance of the light significantly easier. It doesn’t have a flashing mode (illegal in Germany) and it doesn’t need one in my opinion – YMMV. Doesn’t it go out when you stop? … the 1980’s are calling and they want you back! There is a more pricy version called the Toplight Line Brake Plus which uses the energy stored in the standlight to boost brightness when you brake. Ingeniously, it does this by monitoring the frequency of the AC current your dynamo produces, which varies in proportion to speed as the magnets rotate faster or slower. Change of AC frequency indicating braking triggers the extra light, even during the day. I haven’t tried this version of the light and probably wouldn’t consider it such good value, but YMMV. Although a little more expensive than a decent battery blinkie, the Topline Light Plus is robust, never runs out of charge, can’t easily be stolen (and won’t work if it is) and are signficantly safer in terms of motorists’ ability to estimate your distance and vector. After a chain of battery lights, starting with the Cateye LD1100, Blackburn Mars 3, through the Superflash, RSP Astrum, Smart Lunar R2 and the Cherry Bomb, I can absolutely recommend this light without hesitation. 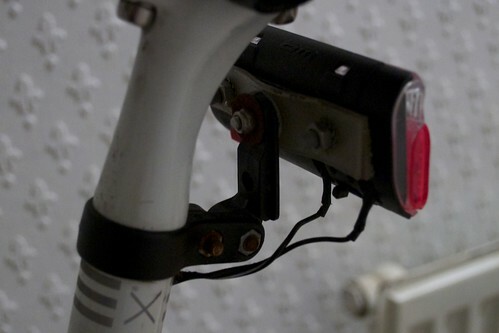 I still keep blinkies for clipping onto clothes and bags or if I want to ride one of our non-dynamo bikes, but they’re a poor second best to the Toplight Line Plus. 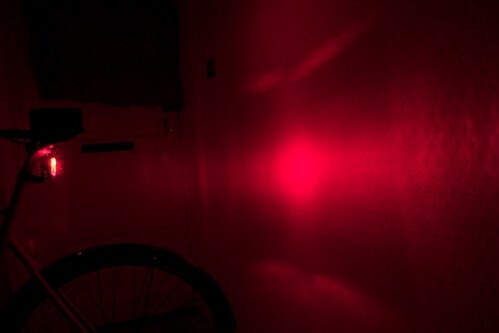 Thanks for the reviews and the photos of the light in use. I also like your MacGyver for the seatpost mount. Nice idea. Comprehensive review. Only thing you dont cover is the chance of wiring probs. Mine snapped on my IQ cyo N. You have to send back to Germany to get ti replaced! The paint flaked off my cooling unit but they are replacing for free. I’ve also got the dtoplight line plus, Lumutoc IQ Cyo and a Pompino and have been looking for solutions for routing the wiring. Currently the rear light wire is just taped underneath the top tube then coiled around my Bagman Sport 2 where I’ve mounted the rear light. How do you route yours? You may not be up for this, but I drilled a hole in the seatpost and one in the downtube (just where the headtube gusset is) and fed the cable from under the fork crown (i.e. routing above the mudguard) into the frame and out of the seatpost via the BB. Cheers Dave, that’s a good solution – don’t know whether I’m brave enough to let loose with the drill though! Hola Filipe. Lamento escuchar su experiencia no fue buena. He tenido dos de estas luces y los dos están todavía trabajando muy bien a pesar de una gran cantidad de lluvia en Escocia! Supongo que el brillo está en el ojo del espectador – tal vez te pueden gustar este artículo como complemento? Busch&Müller Toplight Line Plus is really a great product (lightweight yet strong casing, very bright yet non dazzling light, compact design, top quality reflector) but other Busch&Müller rear lights such as the Toplight Flat model are more reliable: There is (or at least there was in some production batches) an issue with the fastening of the supercapacitor inside the Toplight Line rear light. I have seen several defective units. More generally, it seems that most Busch&Müller dynamo lights are deliberately designed with small openings at the bottom. This is O.K. for most users including myself but it can be disappointing for demanding users who expect completely waterproof products. nice review.the toplight line has since been much improved by the TOPLIGHT Line brake plus model. basically it now has a braking light incorporated in the same package and the led brake strip has been re-worked making much wider and more easily visible to fellow road users from a long way off.